Viking Books for Young Readers, 9780451474773, 304pp. Behind every great superhero is a very angry younger brother. Luke Parker was just your average comic book fan until his boring, teacher’s pet, helps-old-ladies-across-the-street brother Zack got turned into a superhero. Luke can’t believe the unfairness of it all—he’s the one with the encyclopedic knowledge of everything from Ant-Man to Wolverine! At least he can help Zack—aka Star Guy—with all the important parts of becoming a superhero, like using his newfound powers and deciding whether or not to wear a cape. But when Star Guy gets into super-size trouble, it’s up to Luke—and his intrepid neighbor, Lara—to rescue his big brother and, with a little luck, help him save the world. David Solomons has been writing screenplays for many years. His first feature film was an adaptation of Five Children and It (starring Kenneth Branagh and Eddie Izzard, with gala screenings at the Toronto and Tribeca Film Festivals). His latest film is a romantic comedy set in the world of publishing, Not Another Happy Ending (Karen Gillan, Iain de Caestecker), which closed the Edinburgh International Film Festival. 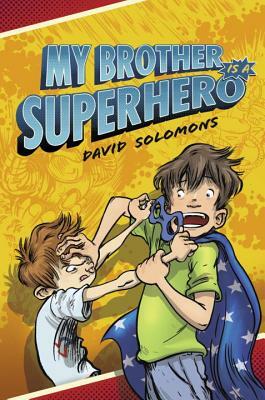 My Brother is a Superhero is his first novel for children. He was born in Glasgow and now lives in Dorset.